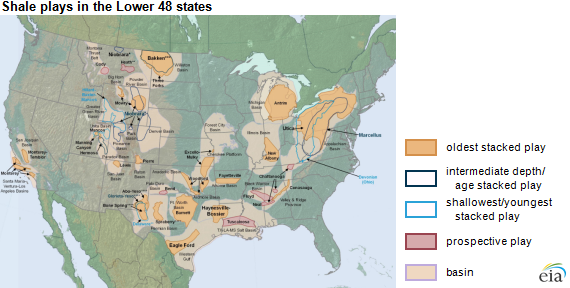 EIA is currently in the process of updating maps of major tight oil and shale gas plays, including the Eagle Ford and Marcellus plays, which will help to better characterize the geology of key areas of production in the United States. 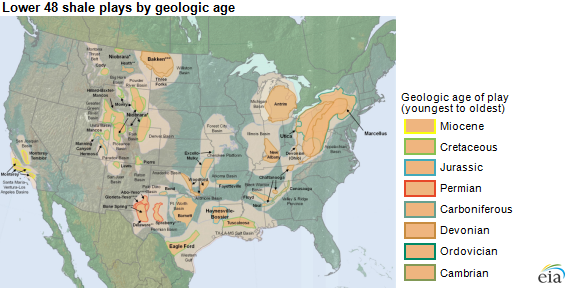 EIA's most recent maps focus on shale and tight oil plays, and characterize plays based on geologic characteristics, including rock type and age. Understanding geologic history and processes helps exploration and production companies reduce the risk of drilling dry, nonproducing wells and better understand hydrocarbon resource potentials. Production of crude oil and natural gas occurs in two classes of rock: source rocks and reservoir rocks. Source rocks are sedimentary rocks in which hydrocarbons (organic chemical compounds of hydrogen and carbon) form. Reservoir rocks are both porous, meaning that there are open spaces, or voids, within the rock, and permeable, meaning fluids are able to flow within them. After forming in the source rock, hydrocarbons, which can vary from simple structures, like methane (a constituent of natural gas), to very complex structures, like bitumen (contained in tar sands), can migrate to the reservoir rock. 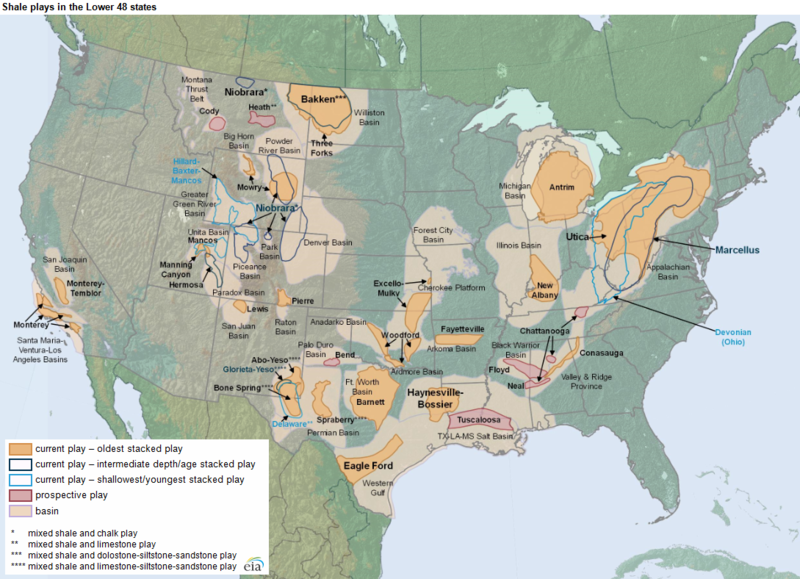 Historically, nearly all hydrocarbons produced domestically were withdrawn from carbonate and sandstone reservoirs. However, over the past decade, production from shale and other tight rock formations, spurred by advances in exploration and production technology, has grown dramatically. Geologic formations that contain oil and gas include clastic or detrital rocks (formed from pieces of pre-existing rocks or minerals), chemical rocks (formed by chemical precipitation of minerals), and organic rocks (formed by biological debris from shells, plant material, and skeletons). The three most common sedimentary rock types encountered in oil and gas fields are shales, sandstones, and carbonates. Classifying these rock types primarily depends on characteristics such as grain size and composition, porosity (pore space within and between grains), and cement (a chemically formed material that holds the grains together), each of which can influence oil and gas production. Shale is formed by the accumulation of very small sediments deposited in deep water, at the bottoms of rivers, lakes, and oceans. Shales are the most abundant clastic sedimentary rock, and because of their potential for a high organic content, shales are considered to be the primary source rocks for hydrocarbons. Sandstone is created by larger sediment, deposited in deserts, river channels, deltas, and shallow sea environments. These rocks tend to be more porous than shales, and consequently make excellent reservoir rocks. Sandstone is the second most abundant clastic sedimentary rock and is the most commonly encountered reservoir rock in hydrocarbon production. Carbonate is created by the accumulation of shells and skeletal remains of water-dwelling organisms in marine environments. The third most abundant sedimentary rock, carbonate (e.g., limestone) rocks are also very good reservoirs and are commonly encountered during hydrocarbon production. Geologic age is an important determinant of hydrocarbon potential, beyond the characteristics of source and reservoir rocks. Identifying fossils, other chemical markers, and correlating rocks across different formations allows earth scientists to determine the age of the rock and to understand the processes that influenced the sediments and organic material over time. 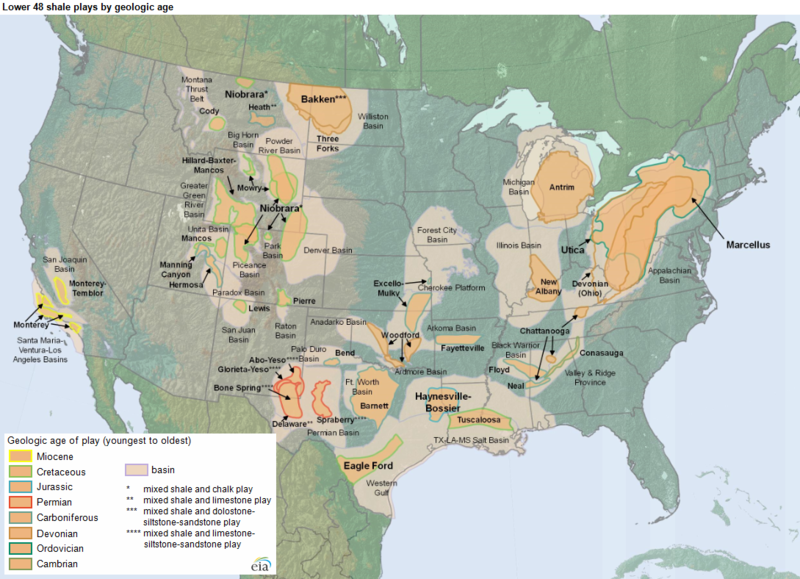 While many rocks of different ages produce oil and natural gas, domestic areas of prolific production include formations from several different geologic periods: the Devonian (416 to 359 million years ago (mya), the Carboniferous (359 to 299 mya), the Permian (299 to 251 mya), and the Cretaceous (145 to 65 mya). During these periods, organic-rich materials accumulated and, over time, heat and pressure chemically altered originally organic chemicals into natural gas and oil.